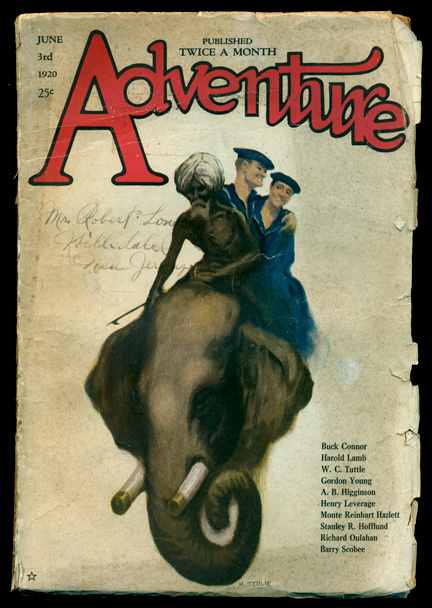 The 1920 issues of Adventure are among the toughest in the entire run, and this one is particularly desirable. It boasts one of Harold Lamb’s early “Khlit” historical yarns, along with the concluding installment of a Gordon Young seafaring thriller featuring Hurricane Williams, one of W. C. Tuttle’s hilarious Westerns, and other fine tales. Condition: Good Plus, maybe Very Good Minus. Significant soiling to front and back covers. Name and address written on front cover. Slight spine slant and creasing. Back cover has three-inch chip, about a half-inch thick. Text block is tanned. This is a good reading copy and an acceptable place-holder for those trying to complete a run.